I'm giving all of you a free trip to Hong Kong!!!!!!!!!!!!!!!!! Free trip to Hong Kong.... Sounds like a scam isn't it? Well, the good news is... It's real!!! Early last year, my Hong Kong trip was fully sponsored, free air ticket, free 5 star hotel, free fine dining two meals a day, and I could even bring a friend!!! It was a dream come true! I was over the moon. Not only I don't have to pay a single cent for my holiday, I was treated like a VIP too. Well, I know you can't share my excitement because you weren't there with me. So, I want to share the same experience with you all by letting you all know, you can win a sponsored trip. Free trip to Hong Kong!!!!! And you can even bring along one person with you. Want or not??? 1. Like HK Station Facebook Page. 3. Go to HK Station at Level 6 Sungei Wang, spend a minimum of RM50 (stuff there are cheap, plus you need to shop for school reopen, CNY, birthday parties, etc.) 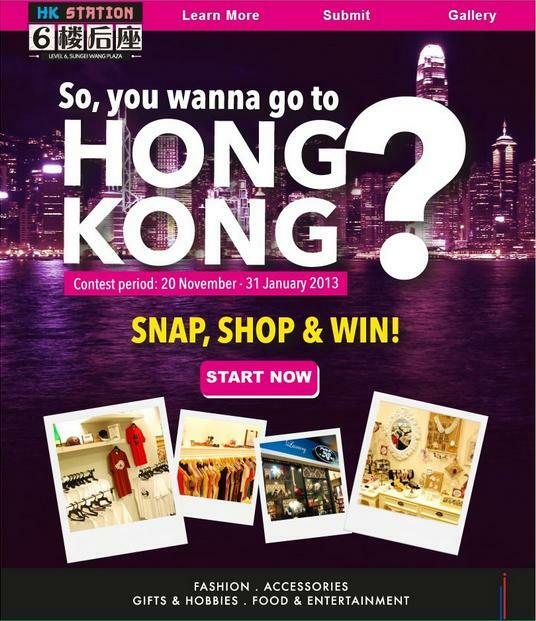 then take photos of your shopping experience there and upload on to the contest app on Facebook. Don't forget to fill up the form and complete a slogan describing Hong Kong in 5 words. I can do it in 1 word... "TVB"! Or two words, "Smelly tofu". 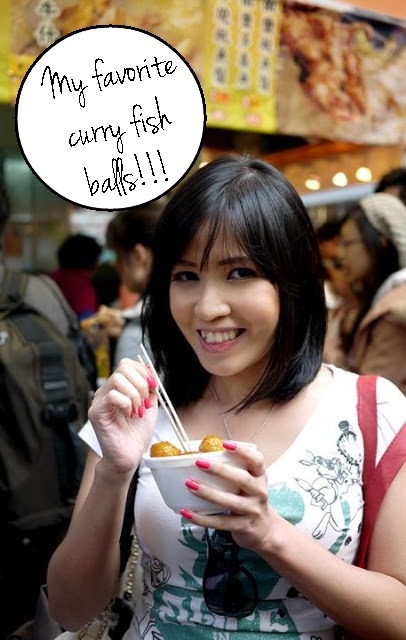 Or three words, "Curry fish ball". If you don't know, Sungei Wang Level 6 recently renovated into a HK Street Style concept called HK Station. When you step into HK Station, you really feel like you're in HK. The ambience and the "feel" is so real! When you take the elevator to 6th floor, you will notice that the mural are in the form of HK MTR station. What interest me most are the fashion stores located there. They sell HK inspired clothes (non-blogshop, of course), which is so hard to find in Malaysia. My favourite pair of edgy pants on the mannequin! Spotted... the shop that looks like Liz Lisa! Going for a swim, anyone? And if you're not into shopping (like a bf who got trapped), you can always enjoy a cup of yin yong tea with egg tarts, or maybe some curry fish balls... They have plenty of cafe there that serve HK food. Already feel like you're in HK? Well, not yet... Until you win the free trip. The last time I check, there were less than 10 people who participated in the contest. There's a very high chance that you will win the trip. And if you don't win the trip, at least you might get some shopping vouchers too! Contest ends 31st January. So don't wait! Faster head to HK Station FB Page to check out more info. ***Photos are from Rebecca Saw. All credit goes to her blog.